From the Novelties collection by Accoutrements. Worlds Largest Underpants. From the Novelties collection by Accoutrements. 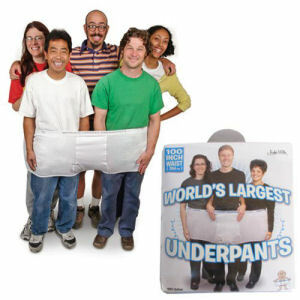 Worlds Largest Underpants. 100 inch waist. 100% cotton will shrink a bit after washing. Accoutrements Novelties Attire shipping from Canada. No Surprise Border fees or Customs!